We have been surprised by the great interest shown by Australian based building automation companies in SyxthSense’s extensive range of room touchscreen controllers, thermostats and room interfaces. They feature BACnet MS/TP communications and can be used in room and zone applications. The room controllers provide accurate and effective control cost-effectively. The controllers offer BACnet device and point discovery making the controller intergation to BMS and BACnet Clients simple, effective and fast. SRT-50 are attractive flush mounted thermostats with a large colour intuitive 3.5” touchsreen for viewing the system status and modifying the settings. The SRT thermostats are suitable for wide variety of applications.. The 320x480 pixel 255K touchscreen provides a dynamic sharp graphical interface to the heating and cooling control. 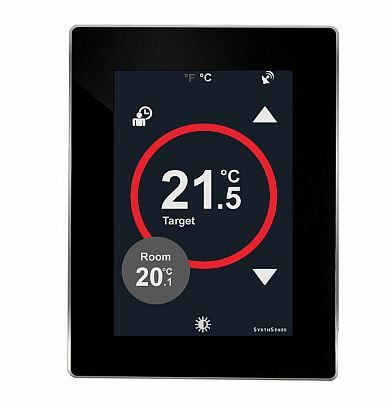 SRC-600 are attractive flush mounted BACnet MS/TP controllers with a large colour intuitive 3.5” touchscreen for viewing the system status and modifying the settings. The SRC-600 BACnet controllers are ideal for hotel, hospitality, offices, commercial application, houses, apartmentone buildings and any other application where attractive user interface is required. The SRC-600 controllers have comprehensive control functionality on-board allowing them to be used in wide variety of applications. If you have a custom project you want assistance with, please contact us with your specification. We offer obligation free quotes on any custom electronics work or PLC programming. Stay tuned for more updates by subscribing to our News RSS and our New Products RSS using your favorite RSS reader.